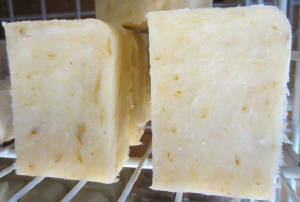 Lemongrass Scrubby 100% Natural "Green Thumb"
Olive Oil, Distilled Water, Organic and Sustainable Palm Oil, Coconut Oil, Lye, Shea Butter, Castor Seed Oil, Lemongrass Essential Oil, Cornmeal. This soap is for the grub monsters in your life! We added a generous dose of cornmeal to help clean up after those really dirty outdoor projects. Exfoliates--I don't use it on the face--your mileage may vary! This is my best selling "scrubby" or exfoliating soap...and has been since I started. Over the years I have changed the exfoliant--first it was pumice, then ground loofah--but for years it has been cornmeal. It gives an almost orange color to the soap that soon settles into a nice yellow. It is a little harsh on my face, and ya know, I am at "that" age where I need every little help to keep "age" from showing-so I don't use it from the neck up. BUT, on the rest of the body it is so nice. Do you have dry looking, scaly, patchy looking skin right out of the shower? START using this soap yesterday. I keep it at the kitchen sink because it is a good cleaner--hubby can use it after working on the car and for my "garden hands" it just works. The scent is so refreshing and almost everyone agrees--strong and true.